Production has officially started today in Wilmington, N.C. for the sophomore season of CBS’s hit summer series Under the Dome. Stephen King, who both wrote the original source material and who serves as an executive producer on the series, will provide the script for the premiere, to be directed by fellow executive producer Jack Bender. Under the Dome tells the story of a small town that is suddenly and inexplicably sealed off from the rest of the world by an enormous transparent dome. The town’s inhabitants must deal with surviving the post-apocalyptic conditions while searching for answers about the dome, where it came from and if and when it will go away. The second season of Under the Dome premieres Monday, June 30 (10pm, ET/PT). 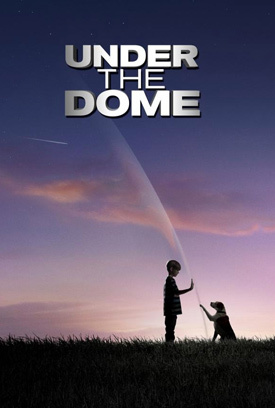 UNDER THE DOME is based on Stephen King’s bestselling novel about a small town that is suddenly and inexplicably sealed off from the rest of the world by a massive transparent dome. The town’s inhabitants must deal with surviving the post-apocalyptic conditions while searching for answers to what this barrier is, where it came from, and if and when it will go away. The summer series is produced by Steven Spielberg’s Amblin Entertainment.